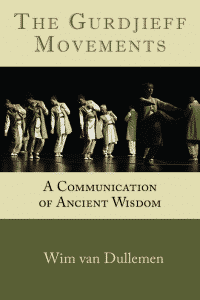 The Gurdjieff Movements – A Communication of Ancient Wisdom is a new book by Wim van Dullemen on Gurdjieff’s hundreds of precise and mostly asymmetrical gestures, arranged into detailed choreographies for groups of practitioners. Van Dullemen reconsiders the eminent role of the Movements, revealing them as a vital yet often-neglected component in the transmission of Gurdjieff’s legacy. Thanks to the publisher we have got the permission to post a chapter of the book here. The chapter explores why Gurdjieff, an esoteric teacher and not a choreographer left such a vast number of extremely detailed dances, how they relate to his writings and compositions. The conclusion is Yes, all of Gurdjieff´s works complement each other. They share ritualistic qualities and hidden meanings which are explained in the book. Van Dullemen, whose first Movements’ teacher received her instructions directly from Gurdjieff himself, is in a unique position to offer theory and first-hand experience about the movements. He is a professional musician and a long-time practitioner of the Gurdjieff work who trained in these Movements and served as a master accompanist for the practice for over thirty years. “No book can teach the Movements,” the author clearly asserts. And, he makes no such attempt here. Far from an instruction manual, The Gurdjieff Movements, A Communication of Ancient Wisdom, offers invaluable insight into and greater understanding of the whys and wherefores of this fourth arm of the vast teaching that comprises Gurdjieff’s complete communication: his books, his oral teachings, his music and finally his Movements. i would like to read the whole book, is it not available? No, this is a new book and I have only got permission to bring a part of it.